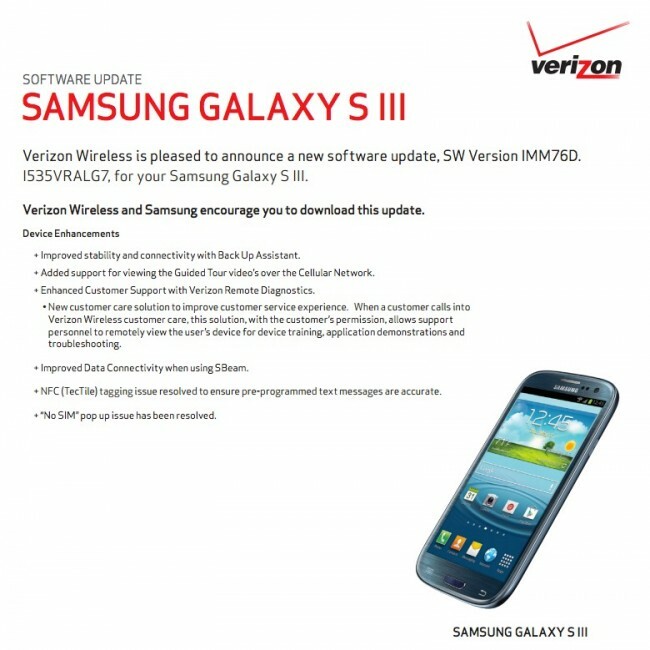 The first update for Verizon’s version of the Samsung Galaxy S3 has been approved as build VRALG7. Many of you will be excited to learn that one of the issues addressed is the “No SIM” error message that continued to pop up time and time again on your devices. We know that more than a few of you were dealing with this nagging issue, as we have seen the various forum posts and petition that were targeted at getting it resolved. Also along for the ride in this update is Big Red’s Remote Diagnostics Tool, something we had yet to see appear on a flagship-level device. Sure, it was included in an update for the DROID4, LG Revolution, and DROID Charge, but nothing of the Galaxy S3’s stature. For those not familiar, the Remote Diagnostics tool allows Verizon to have remote access to your phone during customer support calls. While they can’t use the tool without your permission, you can’t help but feel a bit uneasy over something with this power hovering in the background of your phone. The rest of the update makesBackup Assistant more stable, improves data connectivity when using S Beam, and fixes Samsung TecTile issues with NFC. Normally when we see Verizon approve an update, it starts to rollout to users in a matter of days. As you soon as you see something, be sure to let us know. The update is 30.7MB in size. More info.